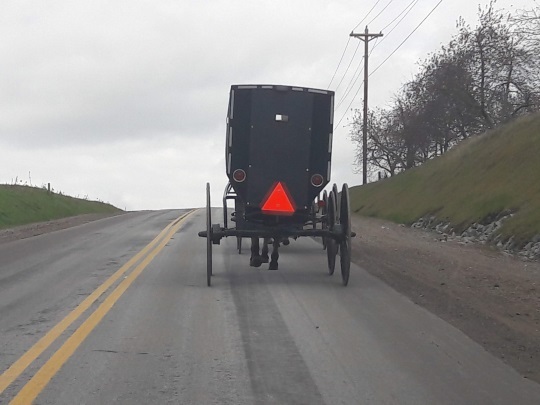 Why don’t they just build buggy lanes wherever Amish live? People often ask just this, especially when there is a bad buggy accident in the news. Realistically, it’s an idea constrained both by budgets and practicality. But in some limited cases, areas with larger Amish populations have done just that. 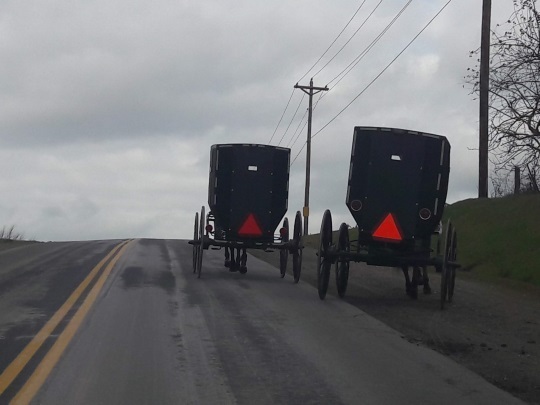 And some Amish-heavy areas will be adding buggy lanes in the next several years. 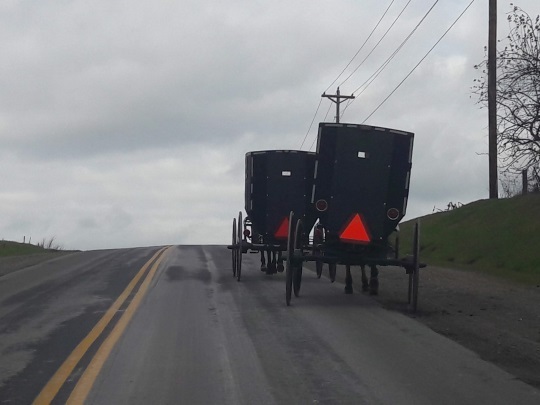 So let’s have a look today at some photos of Amish buggies using buggy lanes. Included here at the end of the post is an odd sequence (at least it seemed to me) of one buggy using a lane to pass another buggy. I took these photos last month on a road in Holmes County. My camera’s geo-location was apparently switched off at the time. But I believe the road featured here is a segment of Mt. Hope Road (CR-77) a bit south of HC-229. I pulled off to the side for a bit and watched the traffic go by. Here is a car approaching a pair of buggies going uphill. As you can see, these are wide lanes which provide ample room for buggies. I think these are more convenient for pulling off when cars come up from behind. I’m not a buggy driver, but I believe the asphalt would be more pleasant to travel on than the bumpier, less-stable gravel. Still, these gravel lanes make a lot of sense especially in these hilly areas, in a couple of situations illustrated in these photos. The two buggies in the right lane above were traveling uphill on the asphalt, while the one in the next photo below was using the gravel lane coming down the hill. Pulling off into the gravel immediately after (or even better, before) cresting the hill is a wise move, as a car traveling over the crest at 45 mph (or faster) can rapidly come upon a buggy just out of sight over the hill, leading to a bad accident. So this buggy driver doesn’t have to worry so much about a vehicle flying over the hill behind him. The lanes are also useful when buggies slow down to roughly walking speed while going up a steep hill. Car drivers get frustrated waiting for the buggy to crest to a safe visibility…and then are tempted to pass when it’s not safe to do so. And to illustrate the point, going up the hill I happened to get “stuck” behind the two buggies which are visible in the above shots. As you can see they were persistently sticking with the main lane, and not using the gravel lane. So I was wondering at this point what exactly the lanes were for, if both buggies were going to use the asphalt while I slowly crept along behind them. Maybe they hadn’t noticed me? 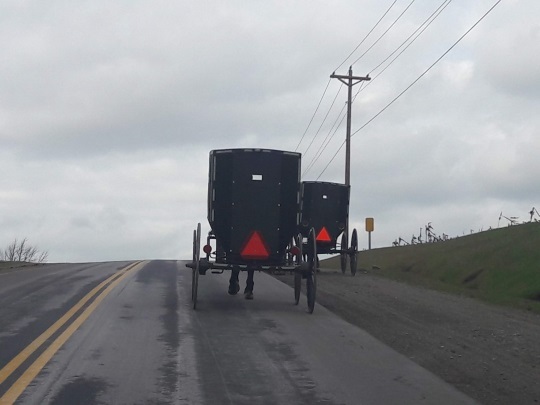 Neither had rear-view mirrors, so they were probably from a more traditional group like the Dan church (Andy Weaver Amish). But suddenly the rear buggy decided it was time to make a move, and pulled off into the gravel. So that buggy disappeared…but the slower front buggy stuck to the asphalt. So in the end it didn’t make much difference to me (I wasn’t about to try the passing move the other buggy made). Holmes County has made its share of road improvements since I first started visiting in 2005, including safety enhancements at dangerous intersections such as the one at CR-77 and State Route 62. Geauga County is widening roads as part of their $14 million safety investment, and Elkhart County, Indiana is planning to start installing more buggy lanes on some of their busier roads by 2020. These particular lanes I believe are relatively new (past 5-10 years). They’re an example of a cheaper solution (gravel) being used to enhance safety on secondary, but nonetheless fairly well-traveled, county byways. Even though the lanes might not have been ideally used in this case (at least not from my perspective 🙂 ), these are helpful improvements, and I am sure are appreciated by local drivers – car and buggy alike. We are support all Amish people & We Pray & Care about all Amish!–We have some Amish are our best friends!–My Mother is part of Pa Quaker Amish!–We love all Amish people! 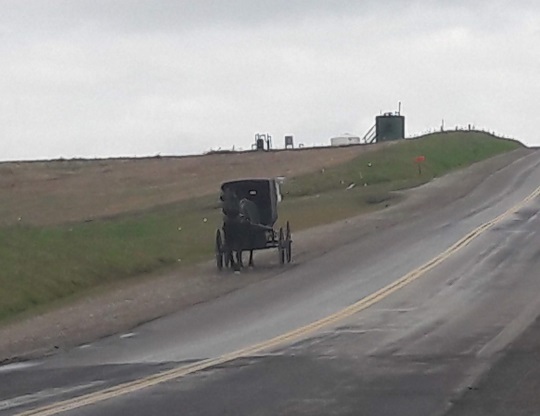 We know & see that Other people driving Cars on road & not watch careful that Amish Buggy/horses on roads! Very Sad ! 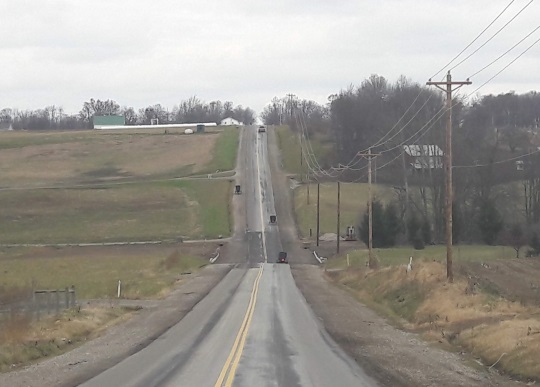 Well if the purpose of the money that went to build these lanes is to provide a safer alternative for Amish to travel upon or pull off onto temporarily (I think most generally don’t like feeling like they are holding up traffic), it would be prudent to make use of them. 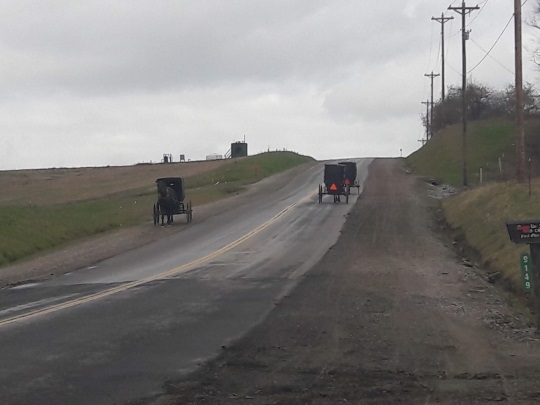 They don’t have to do so of course, but public sympathy is generally with providing safer roads for all and Amish in particular, and using the lanes seems to go along with the idea of keeping Amish safe. The Amish using them and getting value from this investment also seems like it could lead to more public support for any future safety expenditures. There is one of the risks of not having rear-view mirrors. Actually, I don’t think I even look out my back window — I just use the mirrors. I feel the buggy driver is at fault here for not being considerate. He or she was probably simply not paying enough attention! A little toot on the horn would not have been out of line here. As for passing on the right side — NOT a good idea. However, there may be a reason for it. If the horse coming behind was a go-getter, meaning full of pep and hard to hold, having to follow a slower horse can be hard. Holding a horse back really hard can be exhausting and if the horse gets frustrated it can turn into a test of will or strength. I can’t recall ever passing another buggy on the wrong side, but I’ve at times felt tempted to! Great job, Holmes Co.! It sounds, however, like the buggy drivers need a class on how to use the gravel shoulder lanes! It’s quite possible they weren’t aware of me, at least not the lead buggy, which the second buggy was also apparently wanting to get around – I mentioned in the post that these buggies had no rear-view mirrors, in which case you’d need to visually check directly, or rely on hearing my car engine (I wasn’t honking or anything like that). It was a quite newer rental car and I am pretty sure the engine on it runs pretty quiet, especially creaking along at 3 mph, so maybe they simply didn’t realize I was there. working, you should use the hand signals shown below. I have seen “turning signal” set ups like that in other areas, but not here in Ohio. Our turn signals work differently and only go on (one solid, one flashing) when the turn signal is used. It seems risky to me to have it otherwise. That was my thought, makes sense to have it as close to a car turning signal so you don’t have to rely on drivers understanding a different way of signaling specific to buggies. I’m all for buggy lanes, but you bring up a good point. If some buggy owners don’t pull over in congested traffic with the extra lanes, then the $14 million isn’t going to make the road as safe as it would be if buggy owners were more conscientious about using the option. I can imagine the day when the state or federal government makes a law that says all buggies need side view mirrors for safety reasons. Of course, this sounds like a road we’ve been down before with slow moving vehicle signs on the back of buggies. I don’t have an answer. I’m just making an observation. Interesting point Jim – I haven’t heard much of the side view mirrors being a sticking point with authorities (these conflicts are usually about the SMV triangle which you note and also lighting/visibility at night) but that would be another area that could become an issue. Great photos. I travel this area often and this is indeed CR 77. It has been closed for some time to get these lanes constructed. Thanks for sharing. Thanks Michael for the confirmation. I checked Google Maps street view and thought I had found the right area (matched up the barn and the 2 oil or gas installations on the left) and was going to share a screenshot but it didn’t look quite right. I think it was actually just Google’s camera making the angle look flatter. But you can see a difference in how the area has changed. The Google images were from 2008, which made me wonder if and how often they update them (seems like a huge project to travel every road in America in those Google camera cars). I grew up driving horse and buggy and my siblings still do. I would like to think that they would have more courtesy and consideration for the car drivers than is pictured here. The disrespect (or ignorance) is so blatant. Just because they choose to drive at this speed does not mean they should expect cars to travel behind them at their speed. Besides this, it is just plain dangerous for everyone on the road. Sooner or later, someone is going to become impatient and pull out to pass. These situations are just collisions waiting to happen and of course the car driver will be blamed. I love and respect my horse driving relatives. But I really do think a buggy driver in the situation pictured should be liable for a significant fine for obstructing traffic. Don’t get me wrong, I am not anti-horse-and-buggy but my daughter used to drive through a heavily populated old order district every night after dark. There were buggies and bicycles on the road and people walking. She said it was really scary. We need to respect everyone’s right to travel our roads in safety. Yes I was puzzled as to why they didn’t move over…we were rather close to the crest of the hill when I came upon them, so maybe the one in front thought that he’d just stay in the lane for another minute or two. Or it’s possible he didn’t hear my car or see me without the side mirrors on the buggy. No doubt it is a bit of a hassle to pull over but compared with the feeling of blocking traffic behind you when you have a buggy lane built for you a few feet over, I think I would pull over. I could see a fine happening if it were a regular thing. I would give them the benefit of the doubt though in this case. But what you say about drivers getting impatient and trying to pass in an unsafe situation I think is the real danger. Or maybe car drivers would just opt to use the buggy lane to pass if it were a regular thing. I live in Ohio and there are time I travel through Amish places. I always allow myself extra time to get to anywhere I’m going, just in case of who knows what, no matter where I’m going. 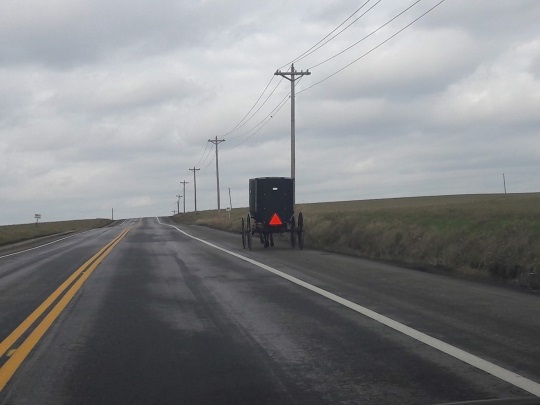 I enjoy my drive if I happen to see an Amish buggy here and there along the way. I don’t find it adds much to my travel time to wait until I can safely pass them up. My husband & I are both van/taxi drivers for the Amish population in the Holmes & Tuscarawas county area. 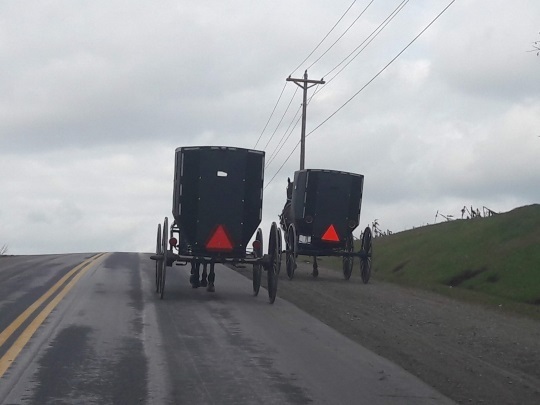 There have been numerous times when buggies were not using the buggy lanes paved or not, and the Amish riding with us have stated that it wasn’t considerate of them not to be using them. Another safety issue is the very common practice of 2 bicycles (or more at times) riding side by side, creating even more of a hazard when trying to pass. Thirdly, look for more accidents happening because of the new “e-bikes” that a very popular in the Holmes County area now. They obviously go faster making it harder to pass. Even the 3-wheel (old folks) bikes have motors! When you are on the road traveling as much as we do you see so much of this. Thanks for the comment Bev, the e-bikes detail you mentioned caught my eye. I’ll have a post on e-bikes in the community coming pretty soon. 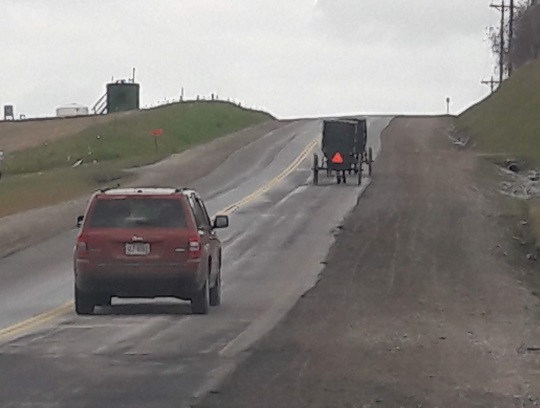 I’m sure you notice things from a different perspective as a driver for the Amish. Why haven’t they put in the buggy lanes in years ago. buggies dealing with impatient drivers. We think it is a great idea. Pretty cool idea, imo. I live in rural Iowa, and saw my first buggy sign EVER the other day! I knew there were Mennonites here, but have never seen Amish! Found it to be pretty cool. Hope they use lanes for their own safety, sadly against a car, the buggy, horse, and person will lose, every time. Do the horses have a preference whether to pull a buggy on asphalt, dirt, or on gravel roads? A better kind of buggy lane? 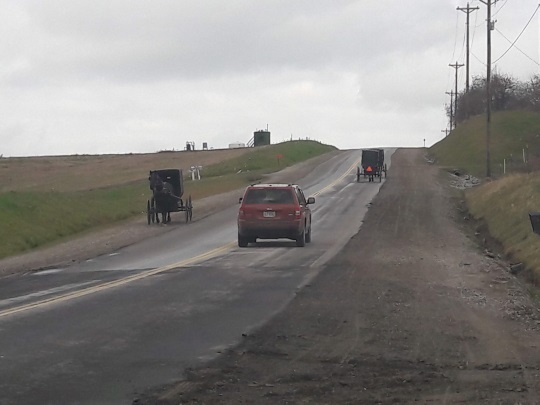 I sometimes wonder whether the ideal buggy lane would have asphalt strips for the wheels to roll smoothly, and a gravel strip in between that the pulling horse would trot upon. The gravel would be less harsh for the horse’s feet, and maybe provide better traction. Is that too much construction work?